Tommy was so fearfully aggressive when he first came into CP’s care that he unnerved vets. He attacked his experienced Fosterer, and she had to be treated at hospital. But Yvonne Wood, a Fosterer at CP’s Epsom and Ewell Branch, knew by instinct that if she persisted with the long-term stray, he would eventually make a lovely pet. Tommy had first appeared in the garden of the Branch Co-ordinator Helen Fisher in early 2012. 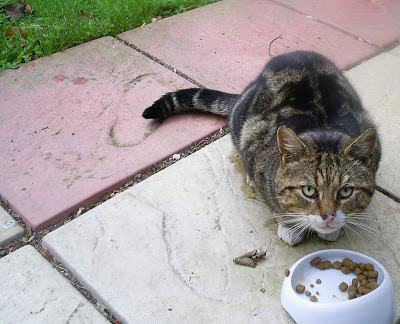 She fed Tommy, gained his trust and managed to trap him, before taking him to Yvonne. 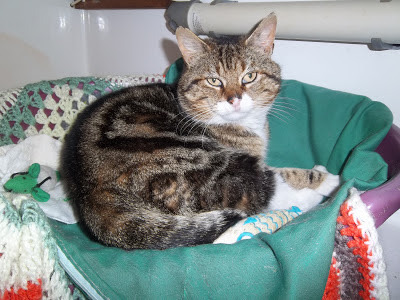 One day, Yvonne received a phone call from a lady who’d previously rehomed CP cats. 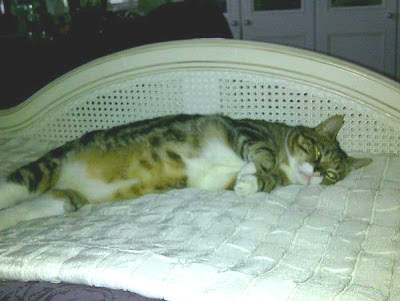 Sue Jones’s cats had died, and she and her husband were looking for a new feline friend. The pair arrived at Yvonne’s house expecting to look at some kittens, but were pointed in the direction of a rather different sort of cat. Burly Tommy trotted across to say hello to them, and they were smitten. “I looked at this great tabby bruiser who’d been with Yvonne for several months and I thought well ok, he wants to come and live with us,” Sue says. Tommy’s history didn’t worry Sue – she was used to caring for challenging cats. Tommy went to live with his new owners in November and – after spending the first day hiding behind the sofa – started to explore his new home. While Tommy ventures outside occasionally, he’s more content to curl up with his owners indoors – and who can blame him? To help us care for more cats like Tommy, support us here. proof that patience and perseverance works. Great to here a happy ending ,rock on Tommy ! This is a great story and proves that many animals who have been labelled 'aggressive' - with time could be helped and rehomed-hopefully this should be a lesson to those animal charities who too quickly decide an animal is not able to be rehomed and are then put to sleep.Good luck to Tommy and his new family - a great story. Thanks everyone. Our branch and centre volunteers and staff do great work and it's nice that their hard work is appreciated. Great story, lovely to hear about such a success. When my CP cat came to me he st under a spare bed for 2 weeks solid. I even had to give him food and water under there as he refused to come out. I sat and cryed as i thought i was going to have to give him back. But after just sitting on the bed and reading after three weeks he creep out and joined me. Now you wouldn't believe he is the same cat, he loves visitors and if hes out in the garden he'll cry at the window asking you to come out and join in. That is a lovely story and sometimes you just need to persist and have patience. I have a rescue cat that has settled in quite well but still wees everywhere. I thought it was a territory thing and I got him a cat flap with a microchip in it, but it hasn't helped a lot. Feliway helps a little - any thoughts anyone? If he is not spraying, but instead squatting down, have you looked at the positioning of his indoor litter trays? Are they easy for him to access, in a quiet place, and away from his feeding area? CP recommends that cat-owning homes have one litter tray per cat plus an extra, even if the cat has outdoor access. Good luck!